This week we have yet another “IZ Sighting” on NBCʻs hit show ‘America’s Got Talent‘. They used “Over the Rainbow” to introduce Alice Tan Ridley, mother of “Precious” actress Gabourey Sidibe. Anybody see this and notice? Takes my breath away. She is special and more talent than the others combined. I was just introduced to Iz’s music a few months Ago. I instantly became a fan. I searched the web looking for more of his music. I found some on sites like Youtube I added all his music I could find into my favorites. Then I found out he had died and was saddened by the news. I know it was some time age but I just found out. He and his music will be missed. his music has always made me tear. he will never be forgotten for his music and story. i am a big fan of his. I looked up this song on google then youtube after hearing a version of it in a tv commercial. 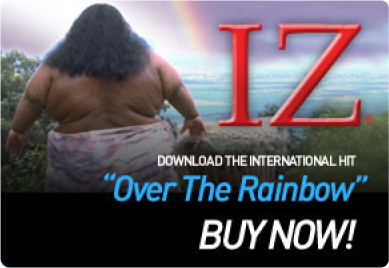 After listening to “Over the Rainbow” repeated ly for the last hour, i felt compelled to write a note of thanks to IZ for his incredible voice. It is very sad that he has passed on but his music and legacy will live on for generations to come. Aloha. IZ és uma voz que marca cada pessoa que ouve as tuas musicas,és como um Anjo falando no nosso coração,ALOHA meu irmão!